A Communist Party leader and police chief in the troubled western Chinese region of Xinjiang have been sacked, the official Xinhua news agency says. 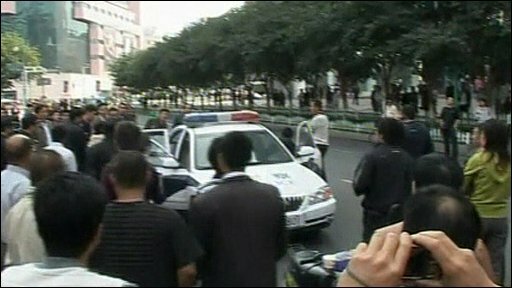 The moves follow days of ethnic unrest in the regional capital Urumqi in which at least five people have died. No official reason has been given for the sackings. Mass protests have followed a spate of stabbings with syringes blamed on Uighur Muslim separatists. Unrest in Urumqi in July left nearly 200 dead. It is not entirely unusual for a communist party boss to be sacked in China following an accident, scandal or some kind of crisis. It is one of only a few ways the authorities can show ordinary people that they've taken their feelings into consideration. But few officials have been sacked quite as publicly as Li Zhi, Urumqi's former party chief. The fact that he has been forced out while this current phase of unrest has yet to subside, reveals just how serious the situation is here. It also shows how desperate the country's national leaders are to persuade Urumqi's Han Chinese population to calm down. But this sacking might not appease them: the protesters had called for Mr Li to step down, but many also want to see the back of Xinjiang's party boss, Wang Lequan. Xinhua first announced that Urumqi Communist Party chief Li Zhi was to be replaced by Zhu Hailun, the head of Xinjiang region's law-and-order committee. A later statement added that Liu Yaohua, director of the Xinjiang Autonomous Regional Public Security Department, had also been dismissed. Correspondents say that protesters who have marched in their thousands through Urumqi in recent days have demanded Mr Li's dismissal for failing to provide public safety. The BBC's Michael Bristow in Urumqi says the sacking is unusual as it shows the Chinese authorities believe they may have made mistakes in the handling of the unrest. Security in Urumqi has been tight this week, after thousands of Han Chinese demonstrated over the alleged hypodermic syringe stabbings. In fresh unrest on Saturday, angry Han Chinese rushed to the city's main square following reports that three Uighur men had attacked a child with needles. Video of the incident showed police driving the boy away and the crowd being dispersed. China's top security official, Meng Jianzhu, arrived in the city on Friday to try to restore order. He was quoted by Xinhua as saying the syringe attacks were a continuation of the July unrest in which 200 people - mostly Han Chinese - were killed in ethnic riots. Xinjiang's population is evenly split between Uighurs and Han Chinese - the country's majority ethnic group. But Hans make up three-quarters of Urumqi's population. Tension between the Uighur and Han communities has been simmering for many years, but July's ethnic unrest was the worst for decades. It began when crowds of Uighurs took the streets to protest about mistreatment - but their rally spiralled out of control and days of violent clashes followed.